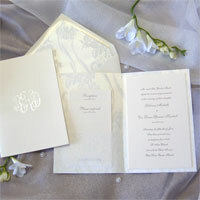 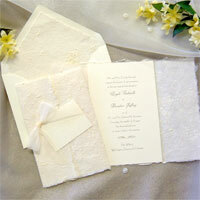 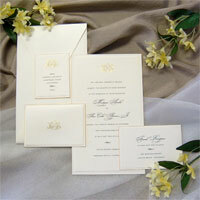 Luxurious and magnificent, these invitations create a lasting first impression for an affair to remember. 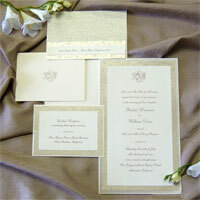 What sets these invitations above and beyond the rest are our exclusive stardust and moonbeam papers, hand-torn deckled edge papers, exclusive handmade papers with inclusions, exclusive silk brocade fabric, exquisite interlocking monograms and our original and incomparable champagne ink. 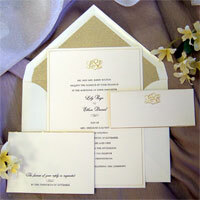 With convenient one stop shopping, you will find every item surrounding the wedding such as save the date cards, announcements, engagement and shower invitations, menus, programs and so much more. 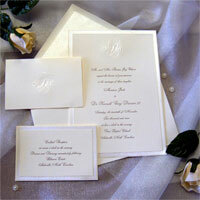 Retail price range $200 to $1500 per 100 invitations.